With as many tales of the post-apocalyptic world as there are being released in games these days, it’s becoming far more imperative to find a new angle to tackle. Whether that be an innovative approach to the gameplay or an interesting end-of-the-world premise, there needs to be that something special to make a game stick out. 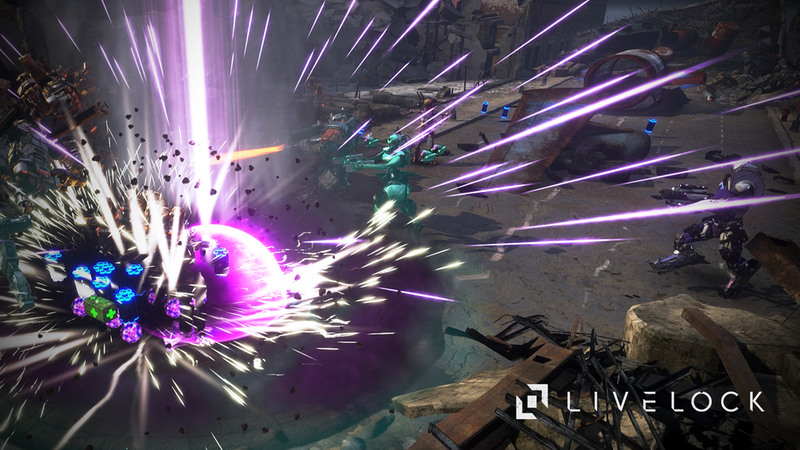 Tuque Games' Livelock accomplishes the latter with a twist combining the human mind and robotics, but falters on the former. Livelock is set in the ruins of what was once Earth. With a global catastrophe imminent, humanity developed a way to upload their consciousness into robotic bodies as a last ditch effort to avoid extinction and preserve their race. However, the apocalyptic event proved to be far more devastating than originally perceived and the cores that were holding humanity, located in New York, Moscow, and Tokyo, were badly damaged. As a result, the minds that were occupying these new bodies went mad and an already devastated Earth was cast back into ongoing conflict. The three original prototypes of this human endeavor, known as the Capital Intellects, are called into action to travel to these cores and save what’s left of humanity. Despite the great introductory cinematic that puts this narrative in motion, Livelock’s story becomes far less important moving forward. A lot of the storyline becomes obscured by corny action-hero dialog and is clearly overlapped by a higher importance that is placed on the gameplay. This is true even with the diversity between the three protagonists with which to experiment playing. There’s the hulking melee-first Vanguard, the long-range specialist Hex, and the basic support Catalyst. Each of these characters directly contributes to the story with their own audio logs that are scattered throughout the game, but it was often the case that the logs were too obscure or thinly detailed to add actual significance to the narrative arc. Considering the game’s interesting premise, it was disappointing to see the importance of the story fall to the wayside. 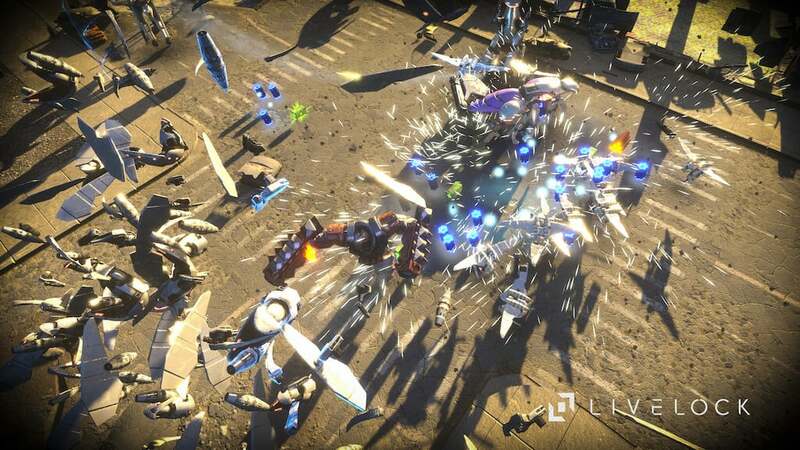 Gameplay is undoubtedly king in Livelock and by the standards of a top-down twin-stick shooter, it’s quite good. You begin by selecting one of the three Capital Intellects, all of whom have unique robotic chassis, and set out across a series of levels that span the three cities. The missions vary anywhere from escorting other friendly robots to clearing out enemy hideouts, and taking on behemoth sized bosses. No matter what the objective may be, it is always guaranteed that the screen will often be littered by massive numbers of enemies, thus ensuring a lot of chaotic moments. This is not always beneficial, however, as it often causes the game to lag while trying to keep up with everything that is happening on screen. Each of the characters have varying combat styles that correlate with their personalities. Vanguard, for instance, is like a walking tank and moves at a slower pace as such, but he feels far more powerful than Hex or Catalyst. This extends to the type of weaponry that each uses. You can have three weapons at a time and new weapons are unlocked after leveling the character up. Special abilities and attacks are also unlocked through progression and range from shields and turrets to hurling mini earthquakes at enemies after stomping the ground. These upgrades help to run through enemies far more easily, but it doesn’t necessarily help to a large degree in the challenge aspect. I wouldn’t describe Livelock as a challenging game for the simple fact that you never actually die. Instead, at any time that your character falls in battle, you simply select an area in close proximity to where you would like to respawn and you’re immediately back to fighting bad guys. There’s no discernable penalty for having to respawn other than losing your current combo, which would then affect your high score for that level. A playthrough on normal difficulty only took four hours to complete and of the levels that were finished on hard difficulty, all signs point to it not taking much longer than before. The arcade aspect with high scores does give players a reason to come back for more, but that replay appeal will only last for so long. Livelock also has its own horde mode called Open Protocol in which you face a constant respawn of increasingly tougher enemies. There is no respawning here like in the campaign, but it still didn’t feel like much of a challenge. One of the game’s achievements is to survive for 15 minutes; despite having a fairly low-level Hex, I was able to unlock it without breaking much of a sweat. While playing alone may be a bit of a breeze, going online for three-player co-op does ramp things up. The rules still apply -- you can die repeatedly and still respawn -- but enemies take a real beating before finally going down for the count. This is especially so when tackling boss encounters as it takes a whole team effort to defeat them with as high a score as possible. The chaotic atmosphere is also ramped up, as it seems that even more enemies are pumped onto the screen at times to confront your team. Matchmaking does have its issues, though, such as getting locked on loading screens between levels with the only eventual solution being to quit out to the Xbox menu. I also had occasional issues finding other players with whom to play, but fortunately you can begin playing alone and allow others to join your game in progress. 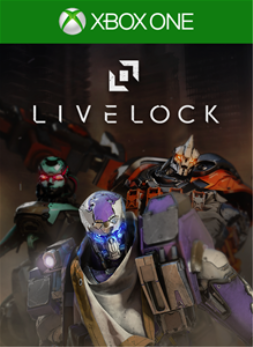 Livelock boasts a full 50 achievements but it still seems possible to complete it relatively quickly, especially with the completion estimates clocking predominantly in the 15-20 hours range. There are standard achievements relating to story progression, difficulty completions, and killing numbers of enemies. There are also achievements tied to customizing your character’s chassis with helmets, capes, and different alloy styles. Perhaps the most time-consuming achievement is to decrypt all of the Master Data Cards, which essentially means killing a certain amount of every enemy in the game. There is also no tracking in-game towards this, so you’ll need to pay specific attention to it. 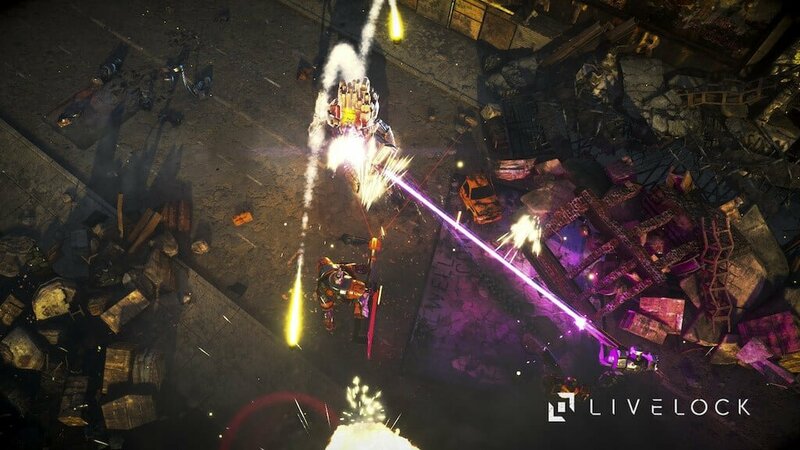 Livelock at its core is a simple and enjoyable twin-stick shooter that faltered due to an equal amount of hits and misses in the heart of the experience. The premise that is set in the beginning is an interesting take on the apocalypse and the human minds connection to robotics, but it felt as if the narrative was left behind and not explored to its full potential, whether through cutscenes or audio logs. While Livelock's gameplay excels in its foundation, the challenge is inevitably stripped from it due to the pursuit of an arcade style feeling. The reviewer spent 7.5 hours playing through the campaign, splitting time among the three Capital Intellects. Along the way, 34 of the game's 50 achievements were unlocked. An Xbox One copy of the game was provided for the purpose of this review.